With bikes, as with cars, more is better. More power, more speed, more style, more class, more exclusivity… More cylinders. More cylinders mean greater sophistication, a smoother, more refined sound and feel. 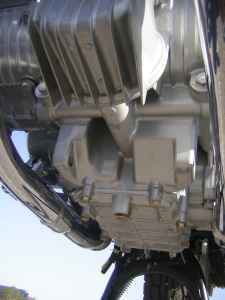 But fitting more than four cylinders into a motorcycle can lead to packaging problems, increased complexity, weight and expense that do not necessarily equal a faster machine. Production roadbikes with more than four cylinders are few and far between: Benelli made the Sei in both 750 and 900 versions, there’s the Kawasaki Z1300 and, if we want to stretch the definition of “production roadbike”, the Morbidelli V8. 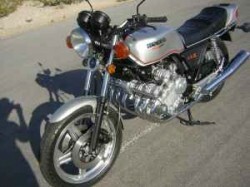 Perhaps the best known example though is the subject of today’s post, the Honda CBX. At a glance, or from the side, the Honda CBX pretty much looks like any other UJM from the late 70’s: unfaired, plastic clocks, twin shocks, five-spoke wheels, a pair of tiny front brake discs, and a little duck tail behind the stepped, two-up seat. Move around to the front though, and things get much more interesting, with a waterfall of shiny pipes sprouting from the impossibly wide cylinder head. 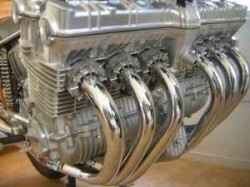 Introduced in 1979 and supposedly only a scant couple of inches wider than the 750 four, the 1047cc, 24 valve, straight six was meant to draw on the racing heritage of Honda’s six cylinder racebikes, but the sophisticated specification and 103 hp of the fantastic motor were offset by its massive weight. At nearly 600 pounds with a full tank of fuel and sporting the typically weedy forks and shocks of the day, the bike could hardly be called “nimble”. Instead of a sportbike, the bike was pitched as a Gran Turismo, a “gentleman’s express”. Its refined manners and effortless power made the CBX an effective, mile-eating tool and the visual impact is stunning: the entire machine appears built around the huge, alloy brick of a motor. So the CBX will never really be a canyon-carver, but I’m not sure I’d want to risk dragging or scraping those naked bits of engine sticking out on either side. Many CBX’s sport crashbars that enclose the engine, but they do sort of spoil the looks, and the installation of modern forks, shocks and tires go a long way towards making this the bike it always could have been. 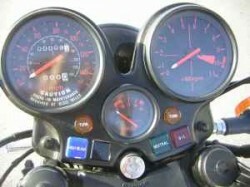 Properly cared for, these bikes are blessed with typically Honda reliability and can rack up miles. In fact, the bike was eventually recast as a full-on touring machine in 1981, with a monoshock rear suspension and a full fairing. “From private Ducati collection- inside collector’s home since new! Has only 0009 original miles. The seller is asking $26,500.00, almost three times the price you’d normally pay for one of these, but with a mere 9 miles on the clock, it’s unlikely you’d ever find one in this sort of original, unmolested condition again. Is it worth it? Well, it seems criminal to rack up miles on such a time-capsule machine, so I’d say this is one for the collectors, not the riders. Me? I’d rather find a derelict example and pull the motor for use in some sort of Spondon-framed café-beast.